With recent releases of LGBTQ+ themed movies and other social media, there seems to be a renewed interest around issues of coming out. 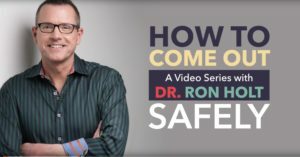 In addition to my “How to Come Out Safely” video series, I am writing a synopsis of my thoughts on the subject. First: Coming out is a personal decision that can only be made by you. Do NOT come come out until you personally feel ready and have the support to do so. Stage 1: You may have periods of uncertainty about your sexuality or gender identity. That is totally OK. Each person must take their time to discover who they are. You can take as much time as you need. The important thing is to not feel pressured to “decide” or to let others decide for you. Once you feel pretty certain about who you are, you can move on to stage 2. Stage 2: Acknowledging to yourself who you are. At this stage two things may occur almost simultaneously. First thing: A sense of relief to acknowledge to yourself how you identify. Second thing: OMG. Now what? Am I going to be accepted? How do I come out? How will my parents react? Etc. This is a stage you should not hang out in by yourself. It’s time to move on to the next stage to get support. Stage 3: Reach out to others who you are pretty sure will be accepting. This is an important time to build a supportive team of people who will love and support you for who you are. This may include your best friends, your school counselor, your school’s GSA or QSA club, etc. There are also online resources where you can find additional support. Once you have a great support team in place, you may choose to proceed to stage 4. Stage 4: Coming out to others outside your supportive inner circle. This may be the time you begin to come out to people who may not be as supportive. Please remember you do NOT have to come out to anyone you don’t want to. Only come out to people if you feel it will make you feel better doing so. The most important thing above all others is to be safe. HAVE A SAFETY PLAN in case coming out to someone doesn’t go well. That may mean have a safe place to go to if the person you come out to is not accepting. Please remember that are many people across the world who support you in your journey. The trevor project has a 24/7 hotline 1-866-488-7386 that is there to support you along the way.